Zeotropic mixtures are given an identification number in the 400 series. This number determines which components in the mixture, and the next letter upper case indicate the percentage. Rooms are arranged chronologically refrigerant approval of ASHRAE. AZEOTROPIC mixture 500 series. Example: R507 (R125/R143a (50/50)). Other organic compounds in the 600 series; figures in ascending order, for example, R600a, isobutane; and inorganic compounds in the 700 series. 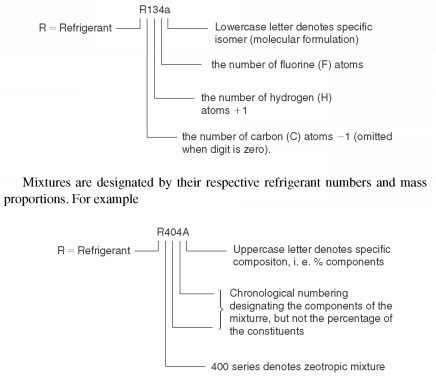 Identification numbers are formed by adding a relative molecular mass of components up to 700. Example: R717 corresponds to ammonia, which has a molecular mass of 17.